O.K., I'm trying to get back into my normal routine, so without further ado, here's today's LTPT. The morning news did all the work for me on this one. 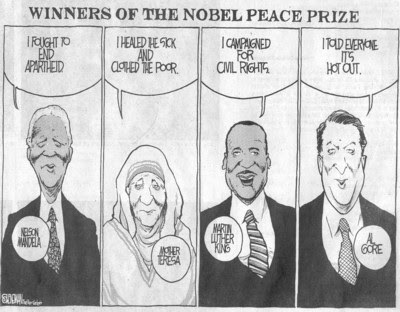 Did Obama deserve to win the Nobel Peace Prize? I'm going to refrain from voicing an opinion just yet because, frankly, I'm woefully uninformed. I don't have enough information to form an educated opinion. I will say that my initial reaction upon reading it this morning was, "Umm, really?" I mean, at least Al Gore invented the internets. So anyway, I'm off to read up on all the nominees this year* to see if someone else deserved it more. In the meantime, let's hear your opinion. *Well crap. Apparently the nominees are kept secret. See how uninformed I am?